Click on any of the photos above to be directed to Yinon Yahel’s web site. 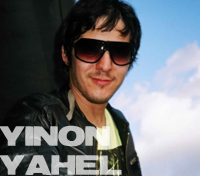 Israeli born producer, Yinon Yahel began his musical career during the mid to late '90s, as the keyboardist for a well known Israeli rock band "Eman". At just 15 years of age, Yinons band Eman was the youngest group to sign a major record deal in Israel. Following a successful career with the band, Yinon garnered respect and attention as he routed towards his current & significant role as a music producer covering various musical genres. Yinons initial focus resulted in ambient & trance music productions. His highly recognized talent and experience lead him to work with another producer by the name of Yossi Sidi on the most successful talk show in Israel The Dudu Topaz Show. By the early years of the new millennium Yinon had become a well established producer in Israel when he teamed up with a famous Israeli DJ, Offer Nissim, as well as a talented singer, songwriter and composer, Maya Siman Tov. Yinons' musical imagination and talent reached international recognition in 2004/05 upon release of the hit album "First Time" (DJ Offer Nissim ft. Maya) 'Star69 Records'. The international release was established as a major success worldwide, providing a unique standard of sound that has trademarked Yinons' electrifying touch. It didn't take long for industry executives to take notice as single after single made its debut on electronic dance charts worldwide including the internationally acclaimed "Billboards". Within a short period of time, Yinons' skill and style proved to be dynamic with immediate reaction and support from fans all over the world. The trio topped the billboard club/dance charts with three Star69 single releases from the album "First Time" which marked Top 20. Offer Nissim ft. Maya reached the billboards with "First Time" (top 10), "Searching" (top 20) and "That the Way I like it" (top 20). 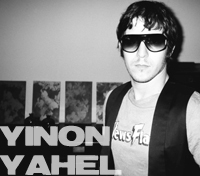 By 2005/06 Yinon expanded his reach throughout the dance community. Noticed for his tremendous work and dedication as a producer & arranger, Yinon was offered to be part of remix assignments for established artists and hits such as Deborah Cox's "Easy as Life" ..1, Kristine W. "Wonder of it All" ..1, Deborah Cooper "Love you all Over" ..2, Amuka's "I want more" topping ..1 on the billboard dance charts, as well as Suzanne Palmer's "Home" & "Fascinated" both reaching top 10. Currently Yinon Yahel is completing his debut album and continues his quest to please music lovers around the globe. His next projects include additional house/dance hits as well as an upcoming R&B releases.